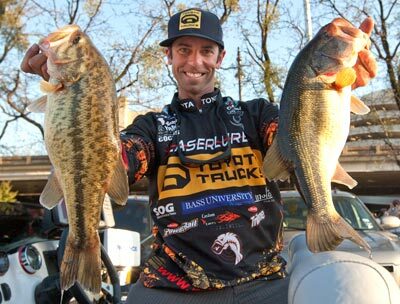 Michael Iaconelli holds up his catch at the 2010 Bassmaster Classic in Alabama. Michael Iaconelli, one of professional bass fishing's elite anglers, is giving his support to help the National Wildlife Federation and Louisiana Wildlife Federation raise awareness for the need to restore and protect Louisiana's imperiled coastal wetlands. Iaconelli's Professional Edge Fishing has joined with more than 350 businesses and organizations nation-wide, including Ducks Unlimited and The International Hunter Education Association in signing a sportsmen's letter to the United States Congress urging it to dedicate resources to build desperately-needed projects to restore Louisiana's coastal habitats. The letter can be read at www.vanishingparadise.org. He will compete in the upcoming Bassmaster Classic held in the coastal swamps and marshes of the Louisiana Delta February 18-20. Tournament weigh-ins will be held at the New Orleans Arena each day with a tackle expo held in the Morial Convention Center that is free and open to the public. "The Louisiana Delta is an incredible fishery because you have so many places you can go and catch a lot of different kinds of fish," he said. "I am very excited to have the opportunity to fish another Classic in these waters. This place is special and we need to do all we can to save these coastal marshes and swamps." Iaconelli won the last Bassmaster Classic held in New Orleans in 2003 and credits that tournament win with helping establishing his successful professional fishing career. "When scouting for the upcoming Classic, we found plenty of bass, caught a bunch of redfish and experienced some of the best fishing anywhere in the country," he said. "Louisiana's coast is a place fishermen across our country should come and experience and want to save. I'm certain that this year's Classic will be just the event to show that." More than 2100 square miles of Louisiana's coastal wetlands, islands and swamps have washed away from Louisiana in the last 80 years while levees and navigation projects built along the Mississippi River have isolated it from the delta it built. That, combined with man-made navigation channels cut through the marsh has led to the fastest land loss rate in the world. The continued loss threatens to completely destroy habitat vital for a variety of fish like bass, redfish and speckled trout as well as shrimp, oysters and crabs and has made Louisiana's coastal communities mush more vulnerable to flooding from storm surges. It has also led to far less habitat for the roughly 10 million ducks and geese that use Louisiana as wintering grounds. "We are very excited that Mike and several more of the best anglers in the world are headed here to fish the Bassmaster Classic because we want the world to see how wonderful our fishing is," Louisiana Wildlife Federation Coastal Outreach Coordinator Chris Macaluso said. "But, we also need those fishing the tournament and watching the coverage to understand that our coastal land loss is so severe that a lot of the marsh that will be fished won't be here in 10 years. We must put the Mississippi River back to work and start rebuilding this coast."